It's the middle ages and the world is ruled by wealthy aristocrats who squander the peoples' wealth on foreign wars in search of natural resources. The common people are willfully uninformed and too absorbed with sporting events, gossip and alcohol to pay attention to the crimes committed by their government and its wealthy suitors. Rather, they are willing to sacrifice their personal freedoms for the promise of security and safety. It occurred to me this week not much has changed since medieval times. The world is still ruled by wealthy oligarchs who live by a different set of rules than the rest of us. Game of Thrones is wholly responsible for my sleep deprivation this week. I figure carp have their own version of Game of Thrones here in the Snake River, where pecking order and mating rights are the rule of law. “If I look back I am lost." It's Friday night and I am exhausted. I logged hundreds of miles this week for work meetings, ran a bunch of errands for the family, cooked a few dinners and skied up Darby Canyon with The Goose. I did, however, find time to squeeze in some fishing. Things have been a bit hectic 'round here lately. The lady went back to work for the first time in three years (which means we have decent health insurance again for the first time in three years) - so running my small business and taking care of the boy when he's not in school have taken a bit of a toll on my fishing. It's all good though. Spring is on the way and we've exchanged snow for mud. I love mud season. It's a tangible reminder we've survived another east Idaho winter - which is no small feat. Heck, my fingers are even still intact. Tomorrow I leave Idaho Falls and head to Missoula for a 15-hour work day. 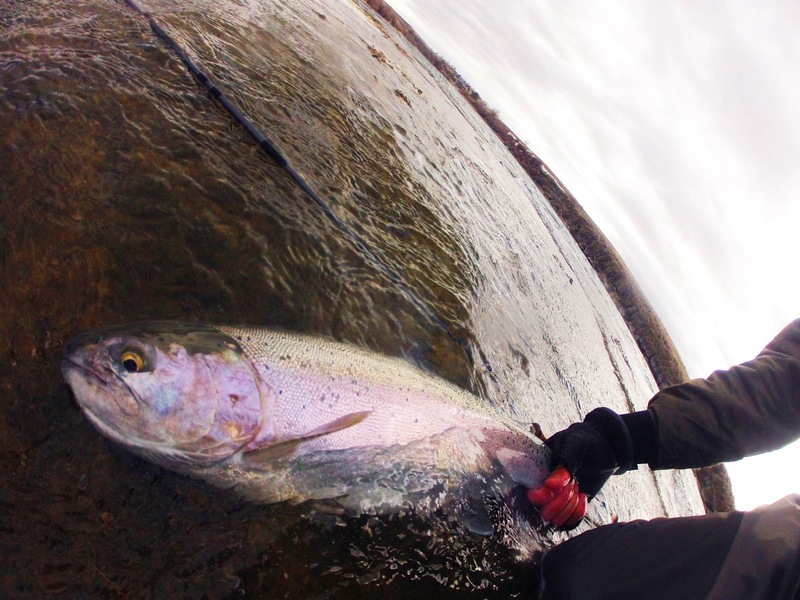 It's a bummer - I'll miss the International Fly Fishing Film Festival's local stop. The good news, however, is that I'll spend Thursday targeting carp on a local flat with Shane. 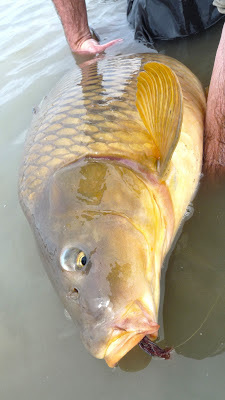 The carp we'll be targeting feed primarily on crawfish, so I've been tying up a pattern (a hybrid between JP Lipton's Carp Crack and Enrico Puglisi's take on the classic Peterson's Spawning Shrimp bonefish fly) specifically for this spot. Sight fishing to bones in Mexico last month made me jones for some carp action. This particular flat is fed by a natural spring - so the water is crystal clear and it's one of the few locations in our neck of the woods where you can consistently sight fish for them. Check back later this week for the first of many carp reports. I almost reached nirvana yesterday. Almost. After hiking in the rain to the place where the beasts live, I volleyed my fly upstream of a deep ledge and waited until the line initiated its swing through the current. The swing was abruptly interrupted by the most violent take I have ever encountered. It was immediately clear I'd just picked a fight with a different caliber of bully. By the time I got my wits about me, the fish was making its way downstream and was well into my backing. I was in hot pursuit, moving as fast as I could downriver in waist-deep water, but the fish was outpacing me. It was pretty clear I needed to get some line and leverage back on the reel and put the brakes on, so I thumbed the drag and tried to turn the fish. It rose briefly to the surface, exposing its dorsal and tail fins. It was the largest trout I'd ever seen - a stout rainbow well over 30" in length. Then, after a brief pause at the surface, it exploded again - snapping my 12 lb. test tippet like a twig. Q: When a fly fisherman yells "F@%K!!!!" at the top of his lungs and no one is around to hear it, did it really happen? I was beside myself, throwing the same cast in the same location, wishing I could hit rewind. In all my years of trout fishing, I have never encountered anything like that fish. It was an entirely different experience. The next hour provided a few more decent 'bows and this brown - before a front pushed through and brought sustained 30 mph winds. Game over. I'll be back - next time with much heavier tippet.